We always travel without a packaged tour as we want to wander on our own pace and be responsible for one travel plan – OURS. Plus, I always find it cheaper this way as you forgo the agency’s services. But for this arrangement to work, extensive RESEARCH and delegation is the key. That’s why the early head start and loads of reading. Lucky for us, travel information is readily available and highly accessible online. Trip advisor, Lonely Planet, Blogs and Forums are our go to source as the data are more or less updated and unbiased. I also ask friends who has been. Being a bit of a research junkie, excel plotting an itinerary and imagining ourselves to be in a foreign distant land gives me a high. Before the trip, we arm ourselves with the must knows on the destination. We read up on the history and culture, landmarks to visit, the cuisine to stuff our faces with, the public transportation and all the other things that might interest us and make our trip as smooth and enjoyable as possible. Day 1 – Our ETA in KL is late in the afternoon and with the transit from the airport to the city, we’re assuming we will get to the city early evening already and won’t be able to do much sightseeing so we think it best to just get the overland crossing to Singapore done with. 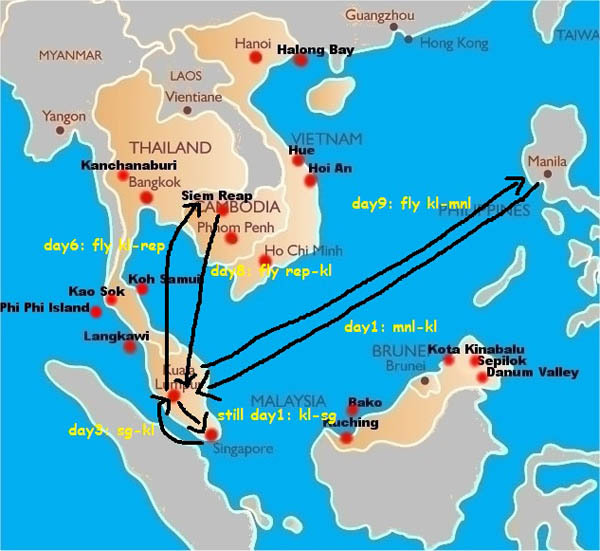 We have 5 days in between the KL to Cambodia flight so we’ve decided to cross overland to Singapore. To maximize our days the trip will be done on an overnight sleeper train (KL-SG and vice versa). Not only do we get to stretch our days, we save on the hotel accommodations too. Day 2 – We’re not big on amusement parks and man made islands, so if you notice, The Universal Studios in SG is not on our list, so is Sunway Lagoon in KL. Day 3 – We’re still on the process of deliberating whether to cross to either Bintan or Batam, Indonesia via a 45-minute ferry ride from Singapore. If we do, we might as well stay overnight and move our trip back to KL a day late. I’d been to Singapore before and with our interests in co-relation with the island state’s size, I think we can cover it all in a day. Yeah, crazy amazing race. But if in case we stay in Singapore and explore more of it, even the usual touristy stops, and go back to KL at night, it would leave us more time in Malaysia and maybe even squeeze Melaka. Decisions. wow..you really are into travel, right? you plan it very much..that's nice..
We try ;-D thanks for dropping by June.